Most people who know me wouldn’t describe me as emotional. My sisters though will tell you it was very easy to make me cry when I was a kid. I have a extremely low confidence level, sometimes I can fake it well, but even then I lack the confidence to believe that I am really confident. When I was a kid, I want to say 4th grade, I was on an undefeated soccer team, and I was 1 of 2 goalies. My dad was my soccer coach at the time, which meant I had double to pressure to not screw up. If the coach’s kid is a goalie and he doesn’t do well it doesn’t take long for the rumbling to be he’s only there cause his dad is the coach. I had, unarguably the most successful season of goalieing I ever had in my life. The stories I am told are that I was never scored on in the entire fall season, I can’t remember it with much certainty, but we can go with that. I usually played the first half and the other goalie played the second. At the end of regulation it was a tie game. I had been out of the cage for half the game and expected to not have the pressure of a shoot out against me. That is when good old dad decided I’d take the shootout(other goalie was a much better shooter than I was). I walked over to my dad and what I thought was going to be an intelligent defense turned into water works. I was scared. The teams undefeated season rested on this shoot out. These were my friends and everyone knows it is the goalie’s fault when you lose. Mi padre pulled me aside,(as I have taught every goalie I have trained in my life you cannot show emotion to your opponents) and looked me in the eye and said its okay to be scared. Whenever you do something for the first time you’re going to be afraid. I’m not putting you in because you are my son, but because it’s the best chance of winning. Still to this day I get scared shitless before I embark on something new. On my way to my first day of college I threw up. I spent two hours in my car wondering what I was doing when I went back for my masters. Most recently when I moved out of my comfort zone to take a job below the poverty line to move forward with a career. Scared-shitless. But I know that if I push through the first initial fear of the unknown great things await. For those of you who have checked out the Goalie Love section of my site know that I have always been a goalie. I haven’t always been the best goalie. 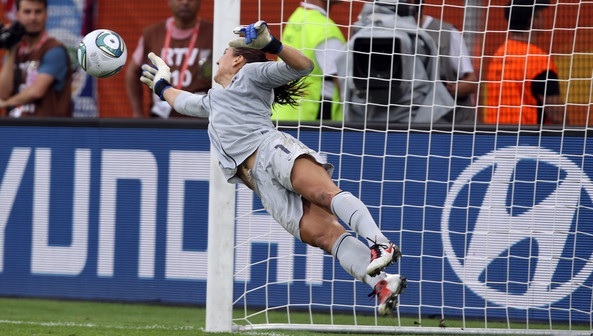 Not like Hope Solo shown below. (To make this clear I wasn’t good enough to make my high school team let alone the Olympics) But goalie was my passion none the less. There has always been one person who has been my coach whether officially or not. That person still to this day is my dad. During middle school when he was coaching my soccer team it was one of the few seasons he had another goalie besides me on the team. I think at the time he was trying to show me how much I needed to improve if I wanted to make the high school team since I wasn’t even the best in Rec League. However that is a lesson I missed at the time. This was one of the few games I out played my counterpart in, but the game came down to a shoot out. When a shoot out happens you have to use the players that are on the field. I was between the posts and he had been playing defense at the end of the game. Therefore my dad could pick either of us to be goalie. Just to make this clear before I continue, my dad understood how little my age group soccer actually meant in real life. He never took it more seriously than a good way for me to stay active and make friends. I don’t want to give the impression he was a Nazi trying to groom me for the Olympics. Back to the point. Either of us could be used for the shoot out. I was smaller. Slower. Weaker. He was better. But I was my dad’s son. That had to count for something. It counted for sitting on the bench watching my team go through the shootout without me. We won. My counterpart blocked better than 50% of the shots. It was a hell of a performance. He told me I hadn’t been training like I used to and he had 15 sons that also wanted to win the game. If I wanted that role going forward I would have to work for it, because it would be a lot easier for him if his heart and head could align on the decision. I understand the game itself had no bearing on my existence, but the lesson I learned that day has stuck with me since. When you have to make a decision that will impact other people you have to lead with your brain over your heart. What is best for you, isn’t always what is best for everyone. And sometimes you have to endure a choice you don’t want to make so others can prevail.